There is a time when music paints a picture, it may not be profound, but it's nice, it tells a little story, and it's a "Grounding". The chamber orchestra version is score for flute, oboe, clarinet, bassoon, horn, trumpet, timpani, and two percussionist or 2 to 4 indigenous drummers and strings. To me a Grounding is a work design to help us connect to our Mother Earth in this work I intend only honor to the all and the one. This work is designed to include native drums as part of the orchestra, not imitating them as much as my own self-expression, and inclusion of the drums in my North-American style. It is an offering of exchange; my work is giving the first nations drummers a way to be part of a work written by a modern North-American composer who is extending the open arms of sharing. 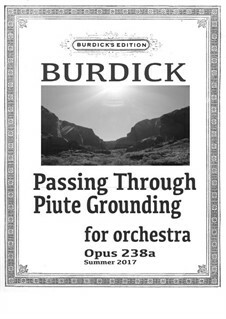 This Work “Passing Through Piute Grounding” is written for the core orchestra plus timpani, and two to four drummers. 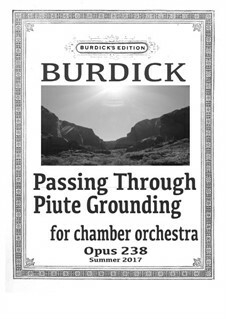 It is base on two of my very early work “Essay for Horn and Bassoon” and the duet “Piute Flutes”, which can be found on youtube. They are works that to me depict mountains landscapes. With felling’s of the importance of giving thanks and honour to all things. The full orchestra version is score for 2 flutes, 2 oboes, 2 clarinets, 2 bassoons, 2 horns, trumpet, trombone, timpani, and two percussionist or 2 to 4 indigenous drummers and strings.